A dentist since 1978, Paul Grussenmeyer has always had a passion for creating art from natural materials. 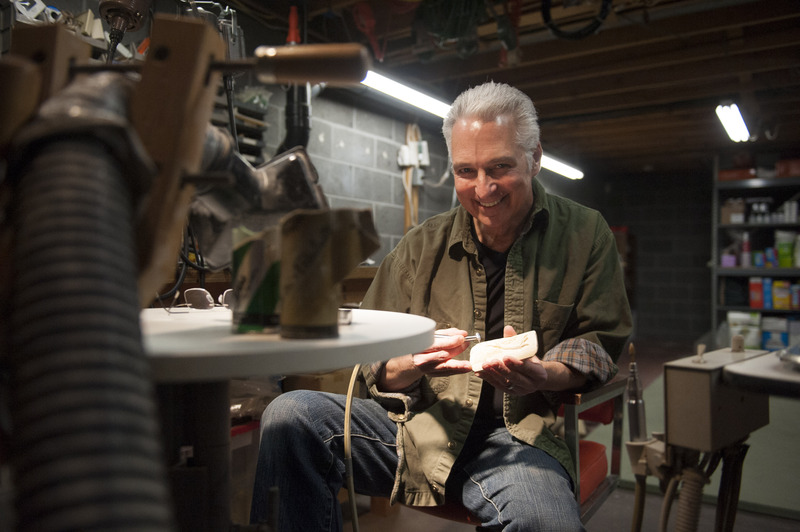 He started carving with hand tools during his teenage years, took time off from his art to pursue dentistry, marry, and raise a family, then restart his artwok after seeing some rough carvings on stag-handled knives at a custom knife show in Manhatten. He has gone "all-in" ever since. Magazine editors who have seen and published his work called him a master carver. His chief desire is to create out-of-the-ordinary, one-of-a-kind gifts for customers to wear, use, and display, therby expressing their own confidence, individuality, originality, and unique spirit. Always being the innovator, Paul has developed a number of techniques for working more detail into difficult materials, plus coloring, highlighting, and preserving his creations. Some customers send Paul carvings from other artists, on which they could see no detail until he brought them to life and made them a more prized possession. Paul Grussenmeyer designs belt buckles, jewelry, bottle stoppers, knife handles, bolo ties, and more, based around his custom carvings from pearl, fossils, corals, rare and exotic woods, marble, gemstones, bone, stag (deer antler), and whatever exotic natural materials he can find. Hunting for project materials while traveling is part of the fun! His work is usually mounted on stainless steel, exotic woods, sterling, or gold. The buckle carvings are mounted on stainless steel blank designs from a couple of steamfitters Paul has used over the years. More recently, he has developed a "Signature Series" of belt buckles with the art mounted into CNC-milled buckles which he designed featuring his PG signature, and a stainless steel jewelry line for men and women. His finished pieces are marked with his PG initials flowing together, and sometimes his full name. Inspiration for Paul's carved designs is derived from nature, literature, movies, zoological and museum collections, other artwork, our natural world, and his own imagination. He also turns customer ideas and wishes into cherished pieces of personal enjoyment. Yes, you can commision your luxury gifts or wearable artwork based upon your own themes and ideas. Paul Grussenmeyer's artwork has been featured in many books and magazines since 1991. 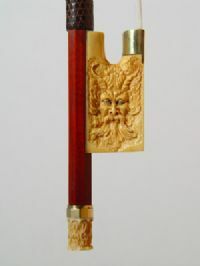 Famed violin bow-maker / jewelry-maker / violinist Henryk Kaston sought out Paul for embellishing all of the ivory parts on his Renaissance Violin Bow Collection, one of which prominently featured Paul's work in the July 2005 edition of Strad Magazine in England, and was displayed in the New York Metropolitan Museum of Art musical instrument section for a year. Waylon Jennings proudly owned one of Paul's carved stag timberwolves on a knife by master bladesmith, James Porter, until he passed away and it was sold at an estate sale. The Randall Knife Museum in Florida has one of Paul's mountain man carvings which they mounted on a Randall knife as part of their public collection. 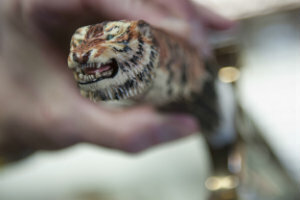 Siberian Tiger that Doc G carved from a piece of India Sambar Stag on a Gil Hibben knife. A Renaissance type antiqued ivory Dr. Grussenmeyer mini sculpture, inspired by Michaelangelo's work, on a Henryk Kaston violin bow. Paul does a proprietary technique to antique any ivory, making it look and feel like it has been around for 100's of years. This technique was passed-on to him by Henryk Kaston, before he passed away at age 100. © Paul Grussenmeyer Custom Creations Capacity theme by Pixel Union, powered by BigCommerce.